Gaming is a significant genre on YouTube. There is a natural synergy between playing a video game yourself, and then watching others demonstrate their gaming prowess. 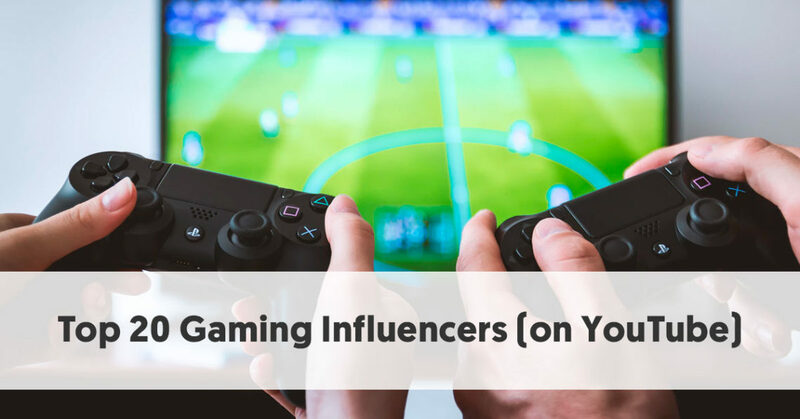 It comes as no surprise, therefore, to find many gaming influencers on YouTube. We’ve recently written about the recent rise of eSports. While most people watch these games via live streaming on networks like Twitch, gamers love to upload videos to their YouTube channels reliving game highlights and making predictions for future matches. Yet the most significant influence is a retro game that goes back to the 90s – Minecraft. Many of the most popular YouTube channels focus on Minecraft mods, and they take you inside the Minecraft World. Incredibly the biggest supporters of these videos weren't born when Minecraft was first published. You could argue that the most popular gamer of them all is PewDiePie – he made his name producing videos of him playing games and commenting on his play. But he has moved on since then. Few of his recent videos have a gaming focus. VanossGaming is the gaming channel of 25-year-old Canadian, Evan Fong. The bulk Evan’s videos involve him playing a game, usually with other YouTube gamers. The Canadian Press describes his typical video as showing, "Vanoss and a group of friends chatting, laughing and making jokes over gameplay from popular titles such as Grand Theft Auto V or Call of Duty: World at War." VanossGaming has uploaded videos since 2011 and has now entered the Top 20 of YouTube channels. Evan Fong has also branched into music, having a music channel called Rynx. Markiplier is run by Hawaiian-born Mark Fischbach, who is now a Californian. He favors the “Let’s Play” type of gaming video, where he uses the video to document his playthrough of a game. He prefers an exuberant and uncensored commentary style. He carries his exuberant, larger-than-life image through his videos. He sometimes appears as Wilfred Warfstache, complete with a pink mustache. He often dyes his hair bright colors. He prefers to play indie and horror games, for example, the Five Nights at Freddy’s series. Markiplier is known for presenting live charity streams, collecting donations as he plays games. He is currently signed up to Polaris, a sub-network of Maker Studios. Sean William McLoughlin, aka Jackseptic eye, emphasizes his Irish roots. Sean’s gaming channel has a green theme, as often does his hair. He begins each of his videos by saying, "Top of the mornin' to ya laddies! My name is Jacksepticeye!" in a loud Irish accent. He began uploading his gaming videos in 2012. He gained the attention of PewDiePie in 2013, who mentioned him in a video. This significantly increased the support for his Jacksepticeye channel. He also favors the “Let’s Play” type of video, where he commentates as he plays a video game. He uploads a couple of videos each day, although they are not all on gaming. Quite a few focus on the life of a gamer. Sean also works with Polaris and Disney and has appeared on D | XP, a television programming block on the Disney XD channel. Daniel Middleton (aka DanTDM) is an English YouTuber. Dan’s channel has evolved since he began it in 2012. In the beginning, he called it The Diamond Minecart (hence the TDM in the channel’s current name). At that point, his core audience was children aged 5 to 10. As the original name indicated, the bulk of his videos involved Dan playing various mods of Minecraft. He found that there was so much fan-generated content in Minecraft that he was able to make videos full-time, with sufficient variation to keep his young audience interested. He changed his channel in 2016, though, to incorporate a range of other games. He also recognized that his audience was growing up. "Most goals scored in a game of Rocket League for a team of 2." "Most goals scored in a game of Rocket League for a team of 3." "Most views for a dedicated Minecraft video channel." As its name suggests, PopularMMOs is a channel devoted to popular Minecraft mods. It is run by Patrick Brown, who is married to fellow YouTube gamer, Jennifer Flagg (who runs the GamingWithJen channel). Patrick clearly takes Minecraft and its mods very seriously. His channel features Minecraft Mob Battles and Arena Battles, Epic Modded Let's Plays, Mod Showcases, and Minecraft Mods Vs. Maps. Jen frequently appears in the videos. The pair has built up an assortment of characters who they feature in their videos. These include Captain Cookie, Captain Cookie Junior, Bellie, The Disguised Man, Carter, Jelly Bean, and quite a few more. Pat has a second channel, PatVsTheWorld, where he competes against viewers in challenges. W2S is the YouTube home of 21-year-old Harry Lewis. He was previously known as wroetoshaw. Most of the videos consist of Harry commentating on FIFA games, with the current focus being on FIFA 18. He operates an alternative channel, W2Splays, showing him playing non-football games. Harry is known for wearing an iconic blue jumper in his videos. He takes part in FIFA ‘Pink Slip’ challenges, which are wager matches played for a FIFA Ultimate Team Player Card. He is known for raging during his games, and this comes across as comical in many of his videos. Alastair Aiken, aka Ali-A, is a 24-year-old British YouTuber who makes videos, predominantly about the various Call of Duty games, Pokemon GO, and Minecraft. He began his channel as Matroix, later changing his main channel to Ali-A, and introducing a secondary channel, MoreAliA. He uploads a Call of Duty video each day and covers the launch of any new game in the franchise extensively. He holds Guinness World records for having the most subscribed and viewed Call of Duty channels. H2O Delirious uploads Let’s Play and gaming videos. He has kept his identity secret, just identifying himself as Jonathon. He is part of the Vanoss Gaming crew and has not yet had a confirmed face reveal. He released prank April Fools videos in 2015 and 2017 where he has pretended to reveal his face. Many of the videos he uploads feature him gaming with his friends, many of whom are popular YouTube gamers. He is renowned for his psychotic “delirious’ laughter. 24-year-old UK-based Tom Cassell has operated TheSyndicateProject channel for the last seven years. People often refer to him as Tom Syndicate. He began the site playing Halo and Modern Warfare 2 videos, but has since widened the games he plays. He is well known for his Call of Duty: Black Ops Zombies videos. Like many other gaming channels, he has a Minecraft section, with a series of videos he’s called, The Minecraft Project. Tom is also well known on Twitch, where he over 2.4 million followers, making his the most followed channel on Twitch. He has had a few issues with the FTC in the past for not disclosing his influencer relationships. Jordan Maron is better known as CaptainSparklez. He has operated this channel since July 2010. He is best known for his videos of Minecraft Let's Plays, animations, and mod/command block reviews. He also uploads videos where he plays other games, most commonly Trials. He also live streams games on Twitch, many of which he then uploads to his second YouTube channel, CaptainSparklez2. Matthew Patrick, aka MatPat, aka The Game Theorists, uploads comparatively educational videos about gaming. His videos cover topics such as the culture behind video games, and he tries to connect one video game universe with another. MatPat takes a much more analytical view of gaming than most of the other well-known YouTube gaming channels. The reason why the channel is called Game Theorists (in the plural) is because he uses a team to host various segments of his videos. theRadBrad is American gamer, Bradley Colburn. He plays games on Xbox 360, Xbox One, PlayStation 3 and 4, and on the PC. He records his games and shares them on his YouTube channel, as well as on Facebook, Twitter, Steam, and Google+. Unlike many of the favorite channels, Brad prefers to vary his gaming and uploads videos of himself playing a wide variety of games. He keeps a very organized channel. Most of his playlists reflect the year the video was made. For instance, he has playlists he’s called 2018/2017 Series, Most Popular of 2017, 2016 Series, 2015 Series, etc. These go back to his 2011-2010 series. Within each year’s playlist, he groups his videos by game. For instance, in the Most Popular of 2017 Playlist, he has a collection of 17 videos about Call of Duty WW2, one with 35 videos about Resident Evil 7, and many similar game-based collections. SSSniperWolf is a relatively rare breed of popular YouTube gamer – a female gamer. In “real-life” she is Alia "Lia Valentine" Shelesh. At one point she called herself "SexySexySniper." Although Lia is British-born, her family moved to Arizona, USA, when she was a girl. She started playing games when she was just six, and her father gave her a Playstation when she was eight. She based her name on the character of Sniper Wolf, a character in Metal Gear Solid. Smosh Games is an offshoot of the popular Smosh YouTube channel. It was set up by the Smosh creators, Ian Hecox and Anthony Padilla, although Anthony is no longer part of the current Smosh team. Smosh Games has a relatively large cast who produce games of themselves commentating as they play, share opinions on the relative merits of particular games, and give game reviews. They have the odd guest star in their videos, including regulars from the main Smosh YouTube channel. They have hosted annual "Smosh Summer Games" and "Smosh Winter Games" events since Summer 2015. TobyGames is one of the channels belonging to YouTube personality and comedian, Toby Turner. His main channel is Tobuscus. Toby is a catchphrase, and he often refers to his viewers as Audience. Lucas Speed Eichorn Watson aka Speedy is an American YouTuber who produces humourous game-related videos. Speedyw03 is his best-known channel, where he has uploaded videos related to GTA, Call of Duty, CS:GO, H1Z1, amongst others. He appears to have placed most emphasis on Fortnite in recent months. Speedy has a second channel, KYRSP33DY, which has more of a Minecraft focus. Our second female gamer is Tiffany Herrera aka IHasCupquake. Tiffany loves both gaming and cosplay and produces videos covering both genres. Tiffany has uploaded videos to YouTube since 2010. She produces a range of videos – only some of which are gaming. Her gaming videos include playlists covering The Sims, Amnesia, Five Nights at Freddies, and The Walking Dead. 23-year-old Canadian, Mitch Hughes, is the Bajan Canadian. He gained this nicknames because although Canadian born, he grew up in Barbadoes (where the locals often call themselves Bajans). He is best known for his Minecraft videos. He focuses on producing videos of competitive mini Minecraft games. These include Survival Games Hunger Games, Battledome, Parkour Speed Runs, and Adventure Maps. Along with several other of the best known YouTube gamers, Mitch now takes part in Fortnite Battle Royale games. Most of his recent videos relate to that game. Adam Montoya is better known on YouTube as SeaNanners. He puts together videos where he commentates on various games. He initially focused on playing Call of Duty on the Xbox 360 but has subsequently changed to PC gaming. He has created playlists covering games such as Resident Evil 7, Mini Golf, Call of Duty Black Ops 2, and Minecraft. As its name suggests, The Family Gaming Team is a bit different to most of the favorite YouTube gamers. They have a younger demographic and therefore are a more family-friendly channel. The channel is portrayed as being run by a Skylander family, consisting of FGTeeV Duddy, his wife FGTeeV Mom or Moomy, their sons Shawn, Chase & Mike, and their daughter Lexi. They, along with DanTDM, are the only gamers on this list who claim to operate family-friendly channels.